The Big Book of Font Combinations by Douglas Bonneville is a unique resource to understand how typefaces work together to create different effects. It’s a source of inspiration and ideas for designers and typographers. 9 Book Design Tips that Authors Need to Know, including how to organize your manuscript and how to avoid unnecessary formatting work, tips on how to prepare your work for page layout. Book Design with Microsoft Word: The Art of Moriah Jovan and the possibilities in a word processor to create great-looking books. Complex typography, graphics, use of white space and multi-column layouts are all possible. 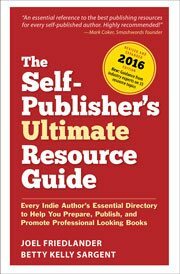 Self-Publishing Basics: How to Pick the Size of your Book. Standard sizes vary for different genres of books, and printing methods may dictate your choices. Offset printing will give you many more size and paper choices than digital printing. A Tale of Two E-Books, one by Stephen Hawking from Bantam, the other by 2 internet marketers from their website. These books appear to inhabit parallel universes that never touch.